San Salvador (Agenzia Fides) - The Archbishop of San Salvador, Mgr. José Luis Escobar, invited Salvadorans to vote responsibly in the presidential elections on 3 February. "Very soon there will be elections, and we must remember that voting in a responsible way is a right and duty of every citizen" said Mgr. Escobar yesterday, Sunday, January 13, during the homily. 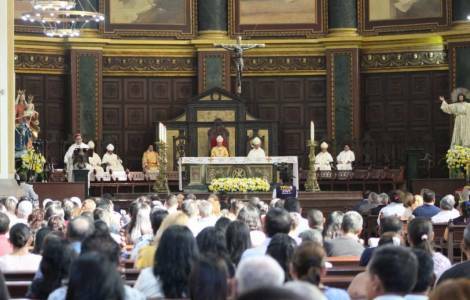 The Mass for the 52nd World Day of Peace was celebrated this Sunday in the Metropolitan Cathedral, entitled: "Good politics is at the service of peace", which was presided over by the Apostolic Nuncio, Mgr. Santo Rocco Gangemi and concelebrated by all Bishops of the Episcopal Conference of Salvador, according to the news sent to Agenzia Fides. On 3 February, just over five million Salvadorans will be called to vote to elect the President and Vice President who will govern El Salvador from 1 June 2019 to 31 May 2024. The Archbishop asked to choose "the people who can best answer the legitimate interests of the people". According to surveys published by local agencies, the former mayor of San Salvador, Nayib Kukele, leads the group of candidates in the elections, overcoming the traditional parties that lost popularity due to former presidents accused of corruption. Mgr. Escobar Alas also took the opportunity to call local officials to "work" for peace by ruling "with justice for the common good", and to avoid any attempt to privatize water, one of the most serious problems. "In a democratic society, water cannot be privatized for the benefit of the few and to the detriment of the poor, it is inconceivable, it is unthinkable" he emphasized strongly. Mgr. Escobar Alas also criticized the tax policies of El Salvador, where, according to him, the tax system "favors those who have more, allowing these people tax evasion, or even granting them exemption". "It is not right - he reiterated several times - to burden the poorest with more taxes, without mercy and without exception".